I’m the kind of person who always needs a goal. I can’t go aimlessly for a walk, or get out of bed without first thinking up some sort of morning project. While my husband is perfectly content with a no-fuss breakfast, I tend to get much crazier than just orange juice. It’s not as though I go all out every morning, but I do regularly heat up the waffle maker, bake fresh granola, or blend up a smoothie. Even if it’s just chopping up apples, bananas and pears or making oatmeal, I like to start my day out with a little project. Sébastien says breakfast is for relaxing, while I say it’s my first chance to get up and at ’em. The same goes for walks. I can’t take Little Buddha for a stroll without having a destination. Elaborate breakfasts give us a mess to clean up (and a second project to tackle), but destination walking gets us into much more trouble. Last year, Le Figaro newspaper compiled a book listing the 100 things you must do at least once during your life in Paris. 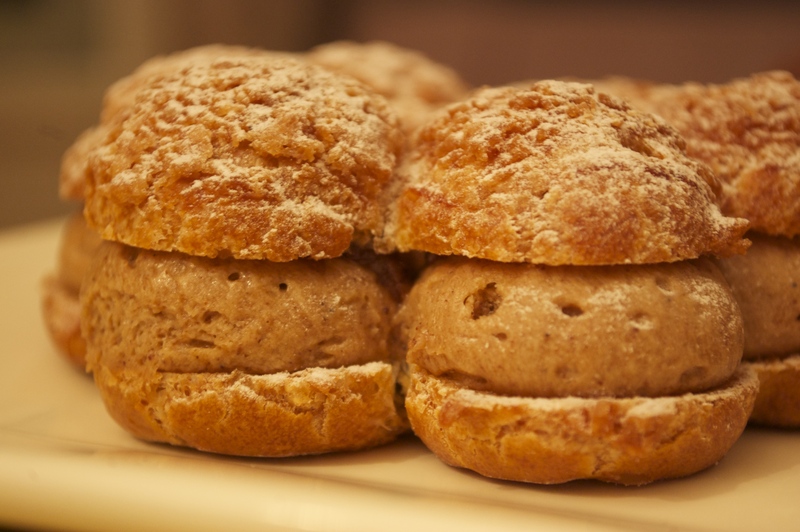 Number 51 highlights pastry chef Philippe Conticini’s paris-brest (What’s a paris-brest? Click here). This led us to a whole new world of desserts (that of Paris’ most-renowned pâtissiers), a whole new goal (try them all), and the ideal walking destinations (the numerous pastry shops spotted throughout the city). Going to Parisian pastry shops isn’t unlike visiting the Louvre. You walk through the front door to admire immaculate pieces of art behind glass cases. Like bakeries, most pastry shops go about their presentation in a traditional, linear way: rows of tempting desserts lined up behind a rectangular display case. Conticini does it differently and gives you the impression you’ve just walked into a wonderland, or as the name of his shops indicates, into a dream. His desserts are grouped in the center of the boutique, under a series of glass, bell-shaped covers. They may not really be floating, but in my memory these bells (reminiscent of those used for cheese) hover magically in the room. The desserts under them must be in on the game. Each time we enter, they dance and glitter on their stage. They taunt and dare us to catch them. Conticini’s paris-brest (from La pâtisserie des rêves) is now on my list of favorite French desserts, but it’s not the only one we’ve tried. We’ve also been tempted by his coffee and chocolate eclairs, orange tart and “Grand Cru” chocolate cake, all of which are well worth a trek. I never like when desserts are too sweet, but prefer when the other ingredients (like chocolate with a pinch of salt) dominate. That’s the case here. In the early months of our undertaking to “try them all” we also enjoyed offerings from famed macaron maker Pierre Hermé (yes, in certain shops he proposes more than just macarons). Visually, we were most impressed by a “dome” covered in thin fragments of chocolate. Again, I’m reminded of the Louvre, of the glass pyramids sparkling before visitors. Taste-wise, we vote for his lemon tart. The citrus beamed with the playful tang of key-lime, but not the innocent kind from childhood in the States. This tart balanced acidity with that hard-to-copy sophistication emblematic of the French capital. We’ve also tried the chocolate shops Jean-Paul Hévin and La maison du chocolat. You really can’t go wrong with either of them, despite their desserts (like Hermé’s) being generally on the sweeter side. 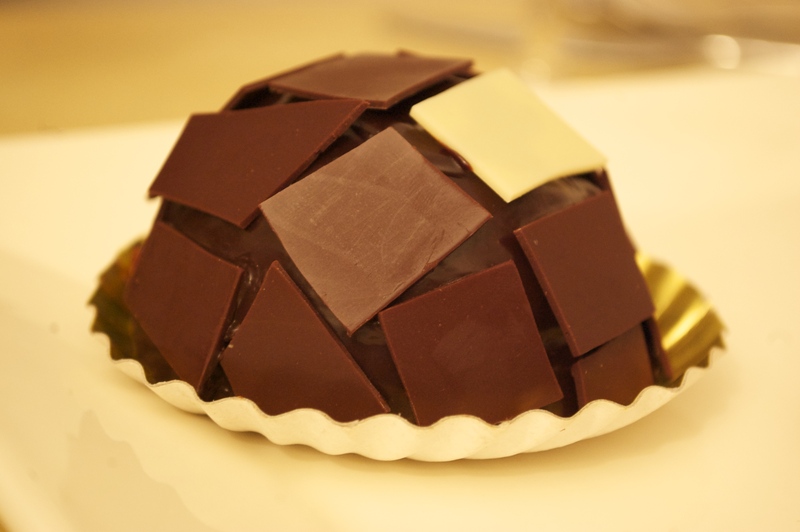 Our most recent discovery has been Cyril Lignac’s shop La Pâtisserie. Let’s just say that if I were to choose only one dessert in all of Paris to eat for the rest of my days, it would be his lemon tart (Sorry Monsieur Hermé. Your’s is a very close second). Philippe Conticini’s pastry shop is full of visual illusions, whereas Lignac’s boutiques are much more simple. His desserts, however, beam with play and mystery. Instead of a traditional tart with filling that sits flat inside a round crust, this one is square and dotted with a series of lemon “drops.” Each drop is covered with a miniature piece of alternating white and yellow chocolate. Then, similar to Hermé’s, Lignac’s lemon tart subtly reminds you that there are other, softer places than Paris. There are lands where warm breezes and limes abound. We also adore a very original dessert called L’Equinoxe, which “artfully” combines Bourbon vanilla, salted butter caramel and speculoos. Yes, that really is the best word to describe the pastries we’ve been discovering (and then re-discovering) over the last few months in Paris: they are pieces of Art, to be taken in by more than just taste buds. This entry was posted in Everyday Life in Paris, French Cuisine Today?, Restaurant Reviews, Travel in France and tagged chocolate, dessert, restaurants. Bookmark the permalink. Incredible fun destination. The photo of the dessert looks so tasty and I’m ready to eat now. When I return to Paris I’m ready to mingle . Thank you for telling me where to go.